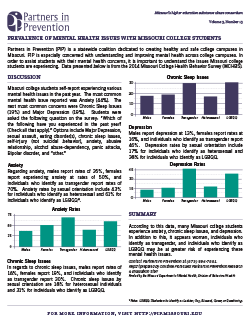 College students’ mental health may be at risk due to the changes in environment and added stresses of college life. While some stress and anxiety can be beneficial, untreated mental health conditions can produce negative outcomes. 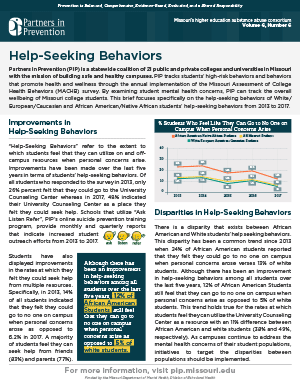 Complied here are resources relating to research and best practices for mental health to aid campuses in providing effective mental health support. 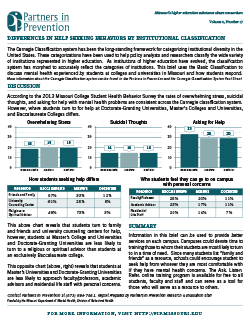 1 in 5 young adults will experience a mental health condition during college. 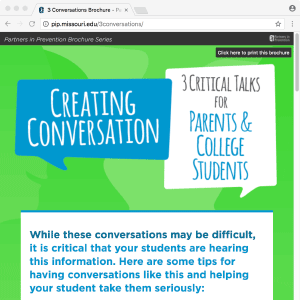 1 in 5 college students are affected with anxiety and depression, which are the top reasons college students seek counseling. Suicide is the 2nd leading cause of death among people aged 15-34. 26% feel overwhelmed with stress, and 18% report that stress considerably impacted or interfered with academic life. 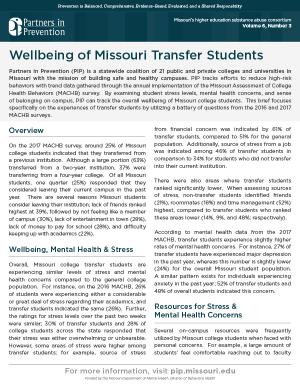 The main sources of stress for Missouri college students include school/academics, financial concerns, future pans, and time management. Other sources of stress include jobs, dating/relationship with partners, family, friends, roommates, physical health, organizations/responsibilities/athletics, and mental health issues. 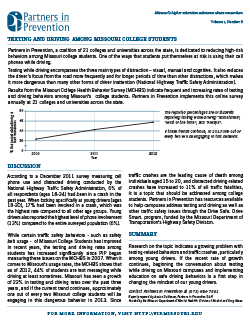 11% of Missouri college students do not feel like they can go to anyone on campus when a personal concern arises. 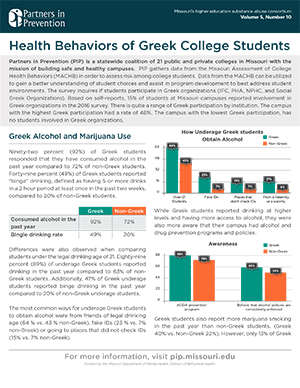 However, most Missouri college students turn to friends/peers both on- and off-campus. 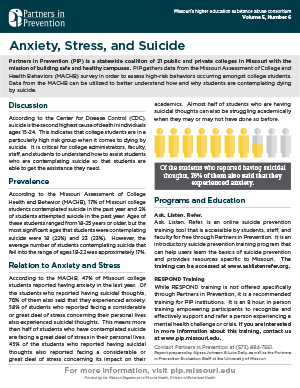 In the past year, 52% of college students in Missouri have experienced anxiety, 27% of have experienced major depression, and 19% have experienced chronic sleep issues. 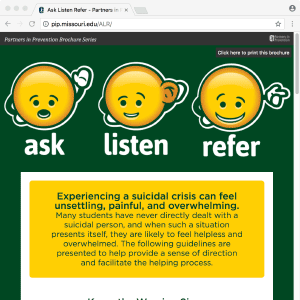 41% of Missouri college students indicate to have had suicidal thoughts, and 20% of Missouri college students have had suicidal thoughts in the past year. Among African Americans, anxiety is a bigger risk factor than depression or substance abuse. The pressures of adjusting to an unfamiliar culture is a risk factor common to many diverse groups, especially recent immigrants, including Asian students and Latinos. Mental health struggles, such as post-traumatic stress disorder (PTSD) and substance use, are common risk factors among returning veterans. 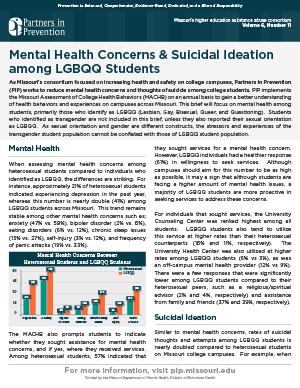 Since members of the LGBTQ+ community often experience higher rates of discrimination, harassment, and victimization, this can increase their rates of major depression, anxiety disorders, and substance use. This also greatly increases their risk factors for suicide. Arab-Americans may be exposed to discrimination and acculturative stress, which can be associated with higher suicide risk. 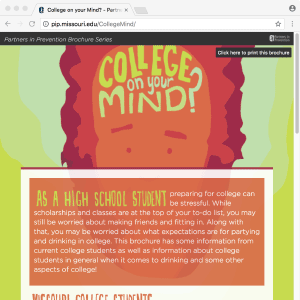 CCMH—the Center for Collegiate Mental Health at Penn State is a practice-research-network that focuses on providing information on the mental health of today’s college students. 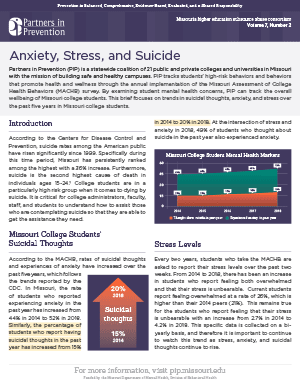 CCMH provides annual reports on college students who are receiving mental health services, reporting on trends and best practices based in practice, research, and technology. 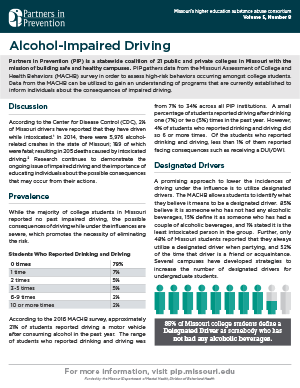 Learn more at ccmh.psu.edu. NCAA Sport Science Institute— The National Collegiate Athletic Association (NCAA) recognizes that mental health is a major factor in the academic and athletic success and well-being of student-athletes. The NCAA Sport Science Institue partners with mental health organizations to research and educate universities, coaches, and student-athletes on the importance of mental health. 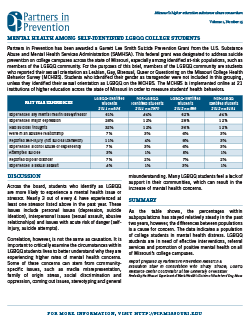 The NCAA Sport Science Institute have researched and published documents on student-athlete mental wellness, such as Mental Health Best Practices and Mind, Body, and Sport: Understanding and Supporting Student-Athlete Mental Wellness. Learn more about the Sport Science Institue at ncaa.org/sport-science-institute/mental-health-best-practices.